So, you've found a book in Surpass Safari that might be just what you've been looking for but you need to see more. If you're at the library, you can get up, go to the shelves, find the book, and thumb through it. No, stay in your seat! Now with Safari 7.30, you can thumb through the book with just a click -- thanks to the new Google Books Preview integration. 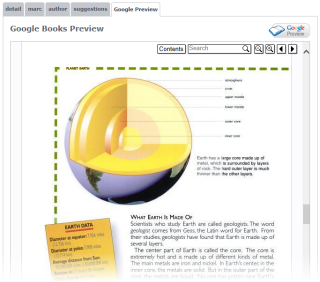 Google Books Preview in Safari shows your patrons a rich preview of the selected title, including the cover, table of contents, and several (sometimes all) pages. An additional link takes patrons to the full Google Books page for the book, which can also include reviews. We think you're patrons are going to love it! Note: Google Books has an extensive collection but not all titles have previews and some ISBNs might not be included.